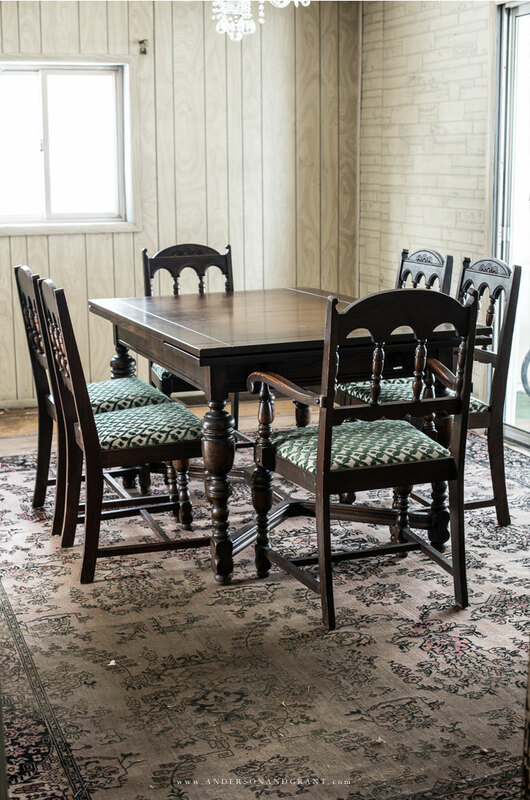 One of the most important pieces of furniture in a home is a dining room table where friends and family can gather around together. 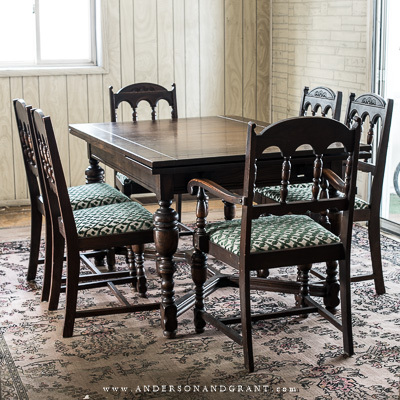 This set is the perfect antique table and chairs for my 1900s fixer upper. 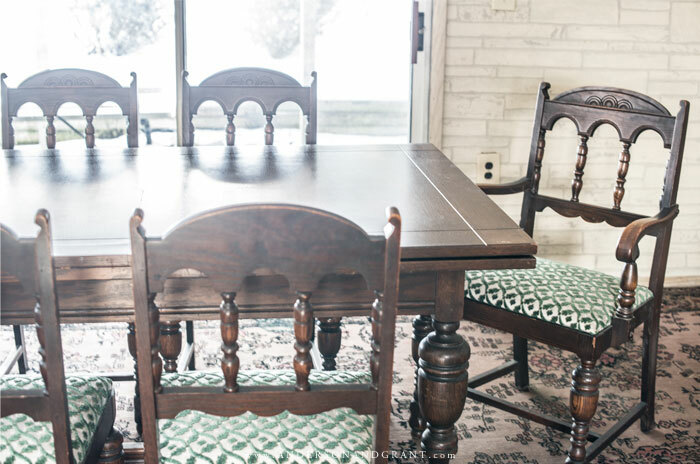 I had every intention of today's renovation post being all about the progress that I've made at the project house, but.....instead I'm going to show you my first actual purchase for the dining room. On Tuesday, I was spending the day tearing into things and as I was stopping work for the day to get things cleaned up and presentable enough to snap a few pictures, I found out that the dining room table and chairs I had purchased were being delivered....in like, 15 minutes. Literally. So the perfectly empty room had to have the rug laid back down to protect the bare wood floors from snowy delivery men boots and was filled with furniture before I could get my camera out. I shot these few quick pictures just so you could see the pretty table. In the basement of this house is an old dining table. And for many, many years, it has been the one thing that I wanted to keep, with beautiful carved legs, a tabletop with routered edges, and leaves that would extend it into a very long table. It was painted red and needed work, but that's what I do, right? Unfortunately, this table has resided in the damp basement for as long as I can remember, and upon closer inspection in the early fall, I had to finally resign myself to the fact that this table was beyond repairing, no matter how much I tried to convince myself that it wasn't. Problem was that I had kind of designed all of my dining room plans on the fact that this was THE table. And when the one piece your room was created around is no longer there and all options are open to you, that feeling of being really overwhelmed sets in. I was starting over from scratch for not only finding a table, but a coordinating light fixture, rug, etc. I'm really drawn to the trestle tables with two chunky pedestal legs. All the ones I found online were pretty expensive for delivery, yet too big to purchase at the store and bring home, and I was also considering getting something handmade by a local company, but that was going be be even more expensive. In mid-October, I was in an antique store about 1 1/2 hours away from home and found an oak table that I felt like was the right one, also equally as expensive as the other two options. It had the most beautiful chairs I think I've ever seen. But as much as I was drawn to this table, I walked away because I knew there was no way of getting it home that day. Months pass, and for some reason, I just could not pick a table. It became clear, though, that until I could finally pick something, I wasn't going to be able to move ahead with this project. My mind kept going back to the antique table and so I finally decided that I'd reach out to the business on Facebook and try to describe the table to see if they still had it in the store three months later. If they did, then my feelings toward the table had been right all along and it was meant to be mine. If it was no longer there, it was never meant to be in my home. Long story short, the employee I was talking to was actually able to understand what table I was talking about and they did still have it. And they would deliver even though I wasn't in the area. Turns out there was also a buffet with the table and chairs, so I inquired if it were possible to get the table for less. I already have one buffet too many as you saw in the pictures of my before tour. She replied that they don't like to split up sets, which I totally get. But I didn't reply back right away, and by the time I went back to Facebook, she had messaged me again to say that they would sell just the table and chairs. So, even with the delivery charge, I didn't pay anymore than I had expected originally. While I probably way overpaid for the table and chairs and I can't explain why I had such feelings that this was the set for me, I fully believe with the way this all turned out that I made the right decision. I've probably said it before on this blog, but I am a girl who, when shopping for something specific, knows what she's looking for and cannot settle and buy something else. Sometimes what I end up with doesn't look exactly like what I thought it would, but I know by the feeling I get that it is the one. Obviously, the chairs will need recovered to work into my design plans, but aside from that the table is perfect. It is five foot long, but the sides pull out and extend to seven feet, so I get the benefit of the long table that I wanted but can also have the additional space on an everyday basis. 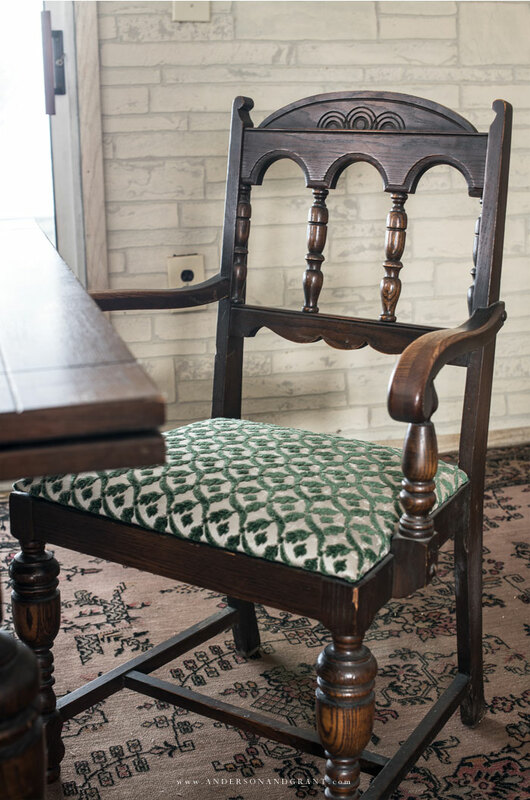 It seems appropriate, too, that an old house like this has an old dining room table rather than something new and modern in style. Even though I don't want to take the look of the interior here back to 1900, some pieces of furniture seem more appropriate than others in keeping with the style of the home. And now with the purchase of what I consider to be the most important piece of furniture in the house, I'm happy to say that design plans are finally moving along and things are coming together.